My 1994 Mazda Protege (which I loved) finally blew a transmission in late March 2013 and off to the new car lot I went in search of my next vehicle! 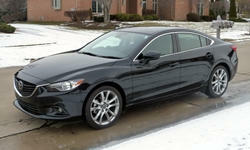 Why the 2014 Mazda Mazda6? Exterior styling of the 2014 Mazda 6 is unique and having owned it for 9 months now, I still get favorable comments on the look of this car to this day, as there still are not that many around where I live in Minnesota. Front grille is much more tasteful than the recent vintage Mazda 3's with their infamous "smiley faces" which detracted from an otherwise really good car. I love the interior styling which is very simple and sleek, cockpit does not look like a 747 aircraft (see Ford Fusion). This is a drivers car all the way. Love the rotary knobs for interior climate controls. One gripe is that whenever I turn on the front defrost, the fan speed automatically increases even if I don't want it to. Seats are comfortable in the Touring edition and every control is logically placed. Trunk is very large especially with the rear seats folded down. I did purchase Weathertech custom fit mat package front and back to protect flooring in harsh Minnesota winters. I do agree with one of the other reviewers that Mazda goofed by providing just an idiot light for the coolant temperature gauge and not a real coolant temperature gauge which is just plain cheap (corporate cost cutting trying to save a few dollars). Same is true for interior sound deadening, which is average but could have been better - car is not bad up until about 75 MPH on the highway at which point the road noise really starts to creep into the cabin. I've read this also may have something to do with the design of the driver side outside rear view mirror. I had the dealership add the auto dim rearview mirror and the fog lights. The 184 HP Skyactiv four banger with variable valve timing is fine for this car unless you really like to push your vehicles hard. Auto transmission is very responsive. Safety features are good, especially like the lane change warning system and the backup cross traffic sensors in the rear quarter panels. Fuel economy is good but not as good as Mazda claims, in 9 months I'm averaging about 28 MPG combined in 60/40 city to highway driving and now in the winter months here in Minnesota, where you need to let the vehicle warm up for a minute or two in cold weather conditions and using winter gas. Still better than most cars in this class and the Skyactiv weight reducing and engine and transmission improvements really do seem to contribute to a fuel efficient car that is still fun to drive and nice to look at! Ride smoothness on the 19" wheels (I have the Touring level trim) isn't overly harsh and they look better cosmetically than the 17" wheels on the Sport model. Electric steering is very precise and odd not to have power steering fluid reservoir! For the cost conscious, the Sports Model is the way to go and an incredible deal in that 21-22K price range. Anyone looking to get away from the Honda/Toyota legions of vehicles on the road today will appreciate the Mazda 6 as there still aren't too many around for the 2014 model, which can easily hold it's own against Accord and Camry and the upstart Hyundai models. I did also consider the 2013 Accord and the Chevy Malibu (which I also liked a lot) while test driving, but kept coming back to the Mazda 6. I am also a repeat Mazda customer (my 94 Mazda Protege was reliable for 19 years if you can believe that) and I like the fact that Mazda is a smaller car company that seems to try harder than the big boys of the industry to please it's customers and supply them with cars that are fun to drive and have good repair records (reliable). To Mazda, cars are obviously more than just "appliances" such as the Toyota Camry's of the world, and I'd rather spend my money on the underdog than feed it to the major players such as Honda, Toyota, Nissan and Chevy/Ford...but that's just me!